In an ideal society, you could simply leave your windows open all night and your doors unlocked. These days that just isn’t the state of the world. Crime is a fact of life here in Florida no matter how nice of a neighborhood you live in. Feeling safe in your own home is a must. So long as proper precautions are taken, you can limit your vulnerability. Locking the doors at night and when you go out, installing alarm systems should an attempted break-in in occur, and getting to know your neighbors – even forming a neighborhood watch group can help add to the feeling of security for all. Adding motorized SuperScreen to your home can allow you to keep the airflow without sacrificing security. Superscreen is tear resistant and would be very cumbersome for a burglar or home invader to cut through to gain entry. It is opened by installed indoor push button or remote control and can not be opened from the outside. Normally leaving your drapes open and windows up would allow outsiders to see in your home, especially at night when the lights are on and it is dark out. SuperScreening, though perfectly visible from the inside out, can be tinted making it tough to peep at the residents inside. This makes your home less of a potential target for would-be criminals. Electric window screens offer privacy and are a great way to keep bugs and burglars out while still letting the breeze flow in. At East Coast Electric Screening, LLC, we serve Southwest Florida including Palm Beach, Martin, St. Lucie and Indian River Counties. Give us a call today at (561)-746-2622. It’s Florida. Those that move here do it partly for the beautiful sunny weather, same for those who choose to stay. Being able to enjoy nature is part of the beauty of being a homeowner here. That means appreciation for the indoor-outdoor areas in your space. Lanais, patios, sunrooms and more. In order to fully enjoy these places, they need to be screened. Whether you already have a home or are in the designing and building process it is always the right time to consider adding motorized electric screens made of high-tech super screen material. Old traditional metal mesh screens can tear, snag, rip, bend and need to be repaired and replaced fairly regularly. This is especially true if you have pets. Paws and claws can ruin a traditional screen in no time flat. SuperScreen, being snag resistant is also pet resistant. Over time they may rust, mold, mildew, even become lose or have bubbles in them, they begin to look worn aging the impression of the home itself. Choosing to work with East Coast Electrical Screening allows screens to be installed that will not only stand the test of time with a limited ten-year warranty on these puncture resistant, fire retardant, mildew resistant screens that are custom fit and even recessed as they retract right into a slim housing of extruded aluminum. This unique housing allows screens to remain undamaged even in the strongest winds, which in Florida during tropical depressions or hurricanes can save you a small fortune in replacement costs or insurance claims. Superscreens can be fitted to garage doors, French doors, windows, patios, lanais, Roman archways, even doggie doors! If you are interested in a quote or simply learning more please give us a call at East Coast Electric screening. 561-746-2622 or look at our website at www.eastcoastelectricalscreening.com. Watching the devastation occurring with Hurricane Harvey, and even some of the recent flooding here in Florida it brings your attention to the build of your house. During hurricane force winds one of the very first things to go is the screening and pool cages. Homeowners need to focus on not only insuring but protecting their property the best they can. Post hurricane trying to replace your screen or caging is a game of get in line with the rest of them. It can take months. Being proactive and replacing your old worn out traditional screening with retractable, durable superscreen is the best answer. They are puncture and wind resistant. Motorized roll down screening retracts back into its case. This is a system that allows you to have a screened in lanai or patio when you want it and you simply roll it up when it is not in use. Screening adds wind resistance and pressure on your frame. When retracted that pressure is gone and your screen safe. The wind is far less likely to damage just the frame when it isn’t being pulled on by the pressure of the wind in the screen like a sail. We currently have more tropical storms out in the ocean. The projected pathways show the possibility of more strong Florida bound storms. Now is the time to find out if a motorized roll up screen is a good fit for you and the cost associated with the system contact us at East Coast Electric screening. 561-746-2622 or look at our website at www.eastcoastelectricalscreening.com. Superscreen is the screen of the future, only the beauty is that it’s here now. Standard metal mesh screening is limited. Once bent it weakens the fibers. Over time that causes rips and tears. These small openings can let in bugs and debris, and over time rip even more. Superscreen is tear resistant, puncture resistant, mildew resistant, and even fire retardant which is key if you bbq on your lanai. SuperScreen outlasts traditional fiberglass screen material and is backed by a Ten Year Limited Warranty. Superscreen is also retractable. By making the decision to install, you aren’t limiting yourself to being enclosed all of the time. Retractable screening rolls up discreetly inside of a thin non-conspicuously mounted housing. Motorization is also installable making retraction a breeze. Living in Florida, hurricane preparedness is a way of life. If you are a homeowner, making sure that your property is easily secured is important. Having retractable superscreens can save you from having to replace or repair your screening post hurricane. 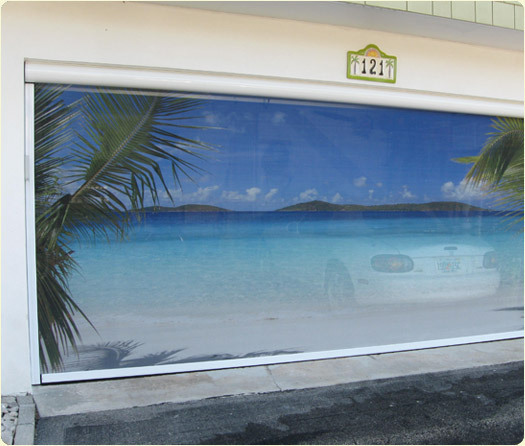 These screens can install not only on porches and lanais but any window, archway, enclosure, breezeway or even garage. They are versatile and come in a wide range of colors. The increased airflow can cut your electric bill by allowing the breeze to cool your home in the fall and winter months as well as increasing the quality of breathable air in your home. Are You and Your Home Protected from the Elements? Florida homes are meant to be enjoyed, inside and out, year round. Built with large lanai areas, porches, sunrooms, and a multitude of windows you can’t help soaking up the sun and sea air. The problem is, this natural beauty also comes with often times lack of shade, bugs and with our summer storms, wind blowing leaves and debris right in. The answer is to have your home SuperScreened. Take these formerly open air areas and give yourself the versatility and option of enclosing at the push of a button with flush mounted retractable screens. They are custom fit to go over any opening to your home, from window screens to door coverings, garages, Roman archways, verandas, lanais, porches, even French double doors. Everything can be tinted or matched to the color of your choice or even add photo-realistic artwork for a creative flair. SuperScreen is aptly named and far superior to traditional metal mesh screening which can rip, tear, fade and puncture very easily, needing cleaning and replacement often. SuperScreen is mildew resistant, puncture resistant, fire retardant, and has a ten-year limited warranty. It can keep out the bugs so you can enjoy your time spent relaxing and entertaining and save you the trouble of constantly sweeping up. Additionally, these wonderful screens also help provide protection from the sun by way of shade filtering. All screens retract into a slim housing which is mounted above or just under the openings when retrofitted and in new construction can be hidden completely. Unlike traditional caging, these will not see damage during storms. If you have a home or are building in the Palm Beach, Martin, St. Lucie or Indian River Counties and are considering screening of any kind, give us a call at East Coast Electric Screening today at 1-888-41SCREEN. We look forward to working with you! Bug Transmitted Disease – Stop the Spread with SuperScreen! Florida is home to 12,000+ species of insects. Many of which do bite humans and pets if given the opportunity. Bug transmitted illness has been a hot topic in the news in recent years with the spread of Zika and the West Nile Virus by way of mosquito. Let’s take a look at the top ranked “most likely to bite” category. Coming in at #1: Mosquitos – Florida has been invaded by the Aedes aegypti (yellow fever mosquito) and the Asian Tiger Mosquito. They both and can carry a huge array of diseases. #2. No-See-Ums: These mini biting midges are a huge nuisance. they are hard to see and leave itchy red welts. #3. Yellow Flies, Stable Flies, and Horse Flies – Mostly found in beach areas their bites sting like you have been pricked with a sewing needle. #4 Fire Ants: Fire ants deliver a painful sting that often leaves a swollen pustule on the bite area. #5 Ticks: The American Dog Tick is common in Florida. Though they do not carry Lyme’s disease as deer ticks do, they can carry Rocky Mountain Spotted Fever and Turlaremia. The Gulf Coast Tick also inhabits our land. It can transmit several pathogens to animal and human. #7 Brown Recluse Spider: These think leggy spiders are toxic and their venom can rot chunks out of human flesh. If you are bitten please seek medical attention. #8 Black Widow Spider: These spiders are also venomous and should be considered dangerous. With all of these creepy crawly creatures around, how do you keep them at bay and out of your home? One of the best and easiest ways is by installing Super Screen™ on your patios, doors, and windows. Super Screen™ is incredibly durable. In a 7 year test of exposure to the elements here in Florida, it lost only 1% strength with no tears or rips needing to be repaired. It is pet resistant, mold resistant, bug proof, and even fade proof.